Here is a slideshow from the 2009 Lakad Tulong that Grace Labaguis, one of the GMA Pinoy TV / GMA Life TV consultants, provided so we can look forward to the kind of fun we can expect. Thanks, Grace! In partnership with the Philippine Consulate General in New York (PCGNY), the foundation aims to surpass last yearâ€™s fundraising result of $12,000. To achieve this increased success, members of all communities and ages are encouraged to get involved as walkers, donors, sponsors and volunteers. Those who make the biggest impact will be recognized for their efforts. Forms and additional information are available on the organizationâ€™s website (see below). The walkathon program will validate the importance of health and fitness. A pre-walk warm-up session, coordinated by a licensed physical trainer, is planned. Following the three-mile walk will be dance segments featuring hip hop artists and â€œDancing on the Square,â€ which is open to all attendees. 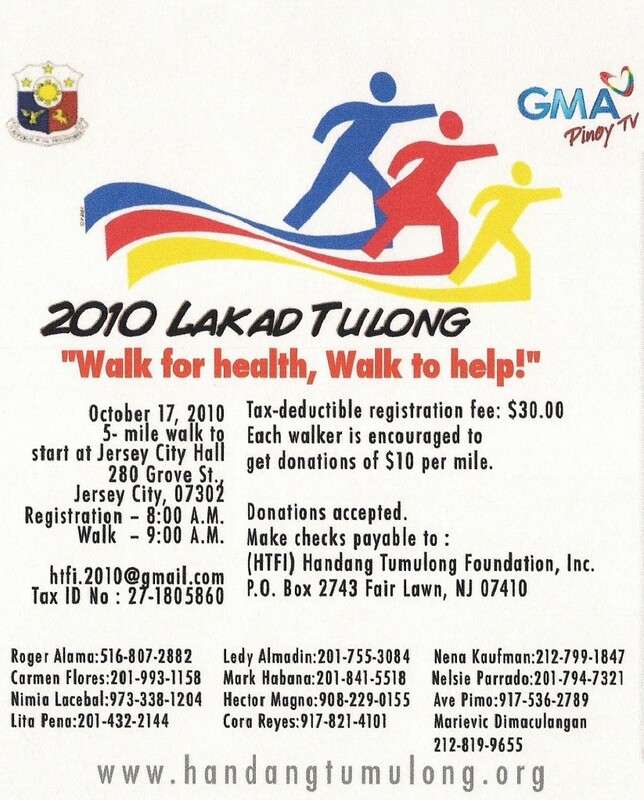 This yearâ€™s walkathon fundraiser will be held in Jersey City, NJ at 8:00 AM on Sunday, October 17, 2010. It is a 3-mile walk starting and ending at the City Hall of Jersey City at 280 Grove St.
All are welcome to support this initiative by raising funds, gathering pledges and participating in the walkathon as walkers or volunteers. Awards will be given to the organization that raises the most funds and the organization that brings the largest contingency of walkers. One individual will also be recognized for bringing in the most donations that day. Registration is now open: $30 for adults, $10 for students with student IDs and seniors (age 70-80), free for seniors 80 years of age and older. Commemorative T-shirts will be available for the first 300 people that register on-site for the event. For sponsorship opportunities, please e-mail the foundation at [email protected] See the attached flyer for more details and contact information. This event is sponsored by GMA Pinoy TV and GMA Life TV, Phil-Am Trading, Phil-Am Foodmart, Casa Victoria and Drs. Greg and Emelie Ongcapin. ABOUT HANDANG TUMULONG FOUNDATION, INC. The Handang Tumulong Foundation is a not-for-profit organization whose primary purpose is to raise funds for the needy in the Philippines, the USA and elsewhere around the world, especially the victims of natural disasters and catastrophes. The Handang Tumulong Disaster Relief Fund is a readiness project for the victims of recurrent calamities in the Philippines. For more information, contact the foundation at [email protected] or visit the website at www.handangtumulong.org. They’re coming to Southern California! 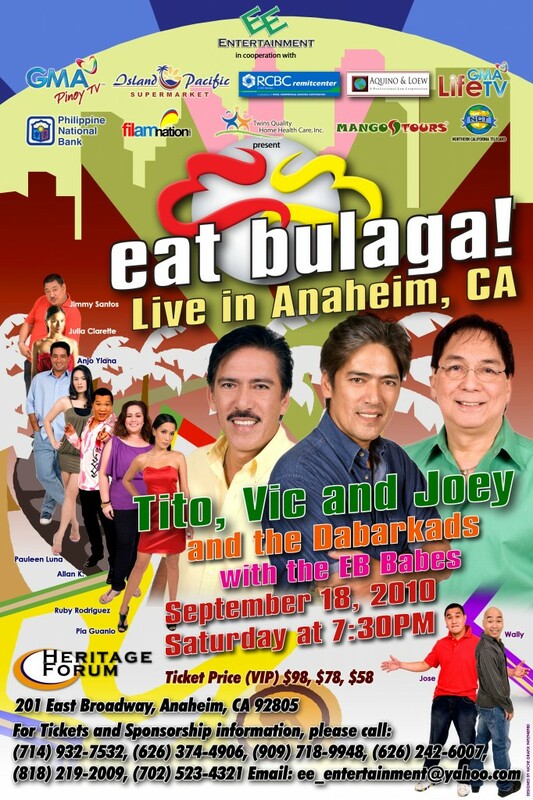 For those who have grown up with “Eat Bulaga!” — the dynamic trio of Tito, Vic, and Joey have successfully reinvented themselves several times with many, many incarnations of beloved Pinoy pop culture and lifestyle tastes. For Americans of Filipino ancestry and “I love Pinoy!” supporters, this is one show you wouldn’t want to miss! According to Wikipedia, Eat Bulaga is the longest-running show in Philippine television, running 31 years — and counting. According to Charina Vergara Carrera: Island Pacific Supermarket proudly supports “Eat Bulaga, Live in Anaheim” on September 18. Tickets are available at all Island Pacific branches in Southern California. Eat Bulaga! is a noon-time variety show in the Philippines produced by the Television And Production Exponents Inc. (TAPE) and GMA Network’s block-timer. The show is broadcast from The New TAPE Studios (Eastside Studio) at the GMA Broadway Centrum in Quezon City. As of August 14, 2010, it has a total of 9,316 episodes since the day it started airing. Eat Bulaga! is aired Weekdays at 12:30PM to 3:00 PM (PST) and Saturdays at 12:00 nn to 3:00 pm (PST). The show also broadcasts worldwide through GMA Pinoy TV. This 2010, the show is celebrating its 31st Year on Philippine Television. Eat Bulaga also holds the record of being the longest running show in Philippine Television. From FilAmNation.com, I was able to get a clear copy of a commercial about the upcoming show from Lorraine Panlilio’s videos.